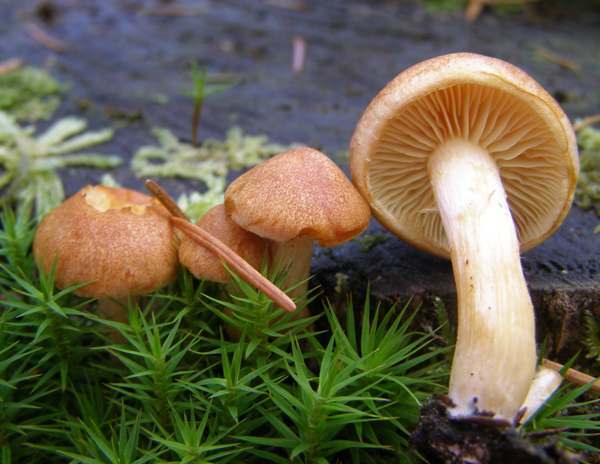 The pale grey gills (never green) of Hypholoma capnoides, the Conifer Tuft, help distinguish it from its poisonous close relative the Sulphur Tuft Hypholoma fasciculare. in Britain and Ireland the Conifer Tuft is a fairly frequent find but nowhere near as common as the Sulphur Tuft. Hypholoma capnoides occurs also throughout most of mainland Europe and in many other parts of the world including North America. 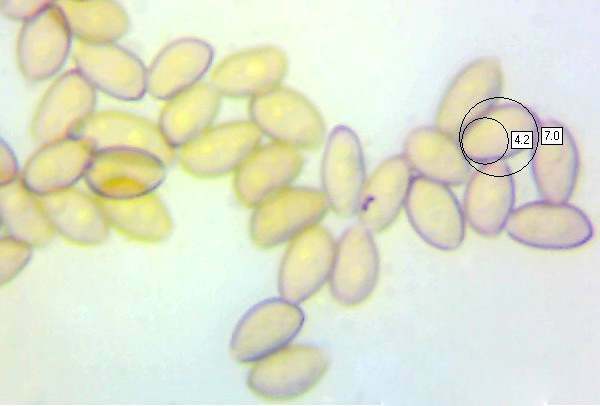 Seen from above, Conifer Tufts are very similar to the Common Rustgill Gymnopilus penetrans, but the spores of the latter are rusty rather than purple brown. Other wood rotters that could be confused with Hypholoma capnoides include certain Galerina and Pholiota species, whose spores are mid brown. It was German mycologist Paul Kummer who, in 1871, established the currently accepted scientific name of this species when he transferred it to the genus Hypholoma. Synonyms of Hypholoma capnoides include Agaricus capnoides Fr., and Naematoloma capnoides (Fr.) P. Karst. Hypholoma, the genus name, means 'mushrooms with threads'. 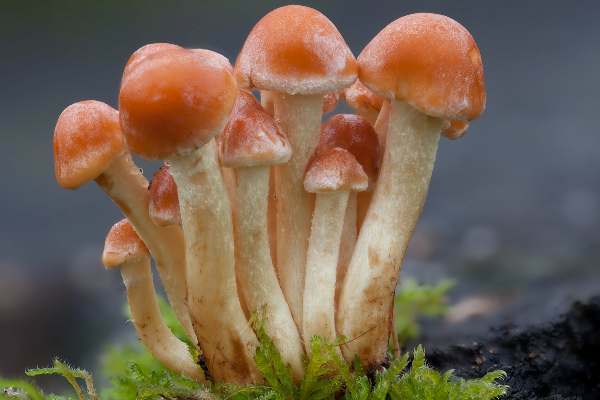 It may be a reference to the thread-like partial veil that connects the cap rim to the stem of young fruitbodies, although some authorities suggest that it is a reference to the thread-like rhizomorphs (root-like bundles of mycelial hyphae) that radiate from the stem base. 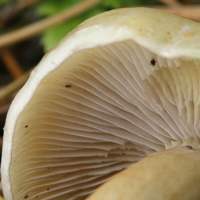 Pale veil remnants are visible at the edge of the rounded hygrophanous caps, which are greasy with bright orange centres in wet weather and dry out to become pale orange-brown. 3 to 7cm in diameter, with pale yellow flesh. The grey adnate gills turn grey-brown as the fruitbody matures. 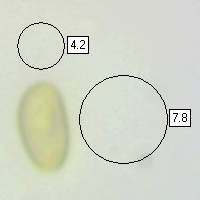 5 to 10mm in diameter and 5 to 8cm tall; pale yellow at the top and rusty brown towards the base. Unlike Sulphur Tuft and Brick Tuft, this wood-rotting mushroom does not have a persistent stem ring. Ellipsoidal, smooth, 6-7.8 x 3.5-4.5µm; with a small germ pore. No significant odour; the taste is mild. 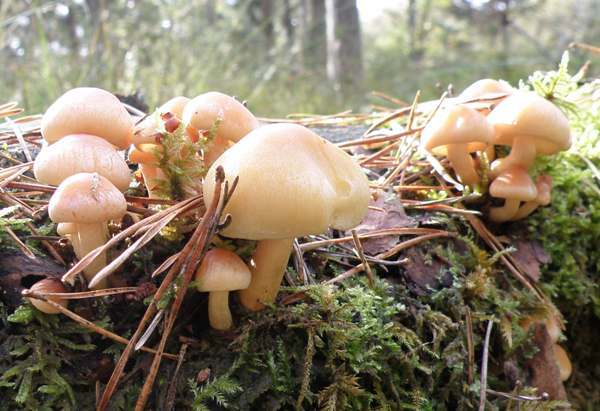 Saprobic, in small tufts or singly on conifer stumps and on buried or exposed roots of dead conifers. 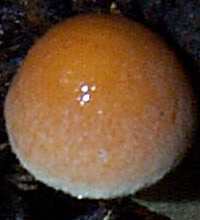 Hypholoma lateritium, commonly referred to as Brick Tuft, is a larger species with a brick-red central zone and paler margin; it has creamy-yellow gills when young. Generally considered edible, this woodland mushroom is easily confused with other fungi (for example Sulphur Tufts) from the same genus that are inedible or even poisonous as well as Galerina marginata, commonly referred to as the Funeral Bell, which is deadly poisonous. 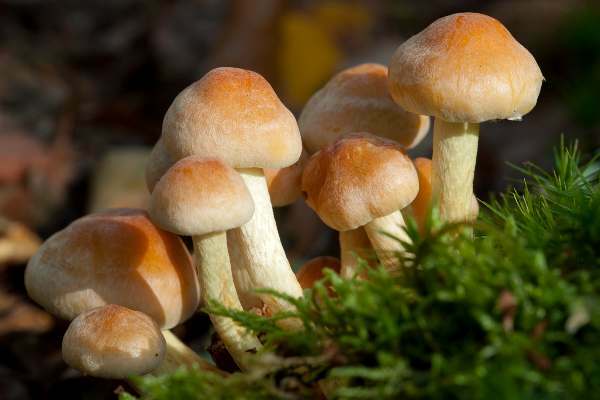 If you need a further disincentive the small size and infrequent occurrence of Conifer Tuft surely make it a mushroom that is not worth collecting to eat.